Summer’s bounty creates endless options for delicious gluten-free summer salads perfect for grilling out, picnics, cookouts and potlucks. 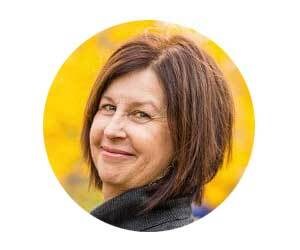 Recipes are made effortless thanks to all the ripe, flavorful ingredients of the season! 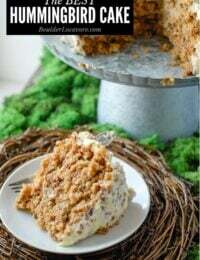 When holidays or long weekends roll around I think most of us are focused on the main dish or a fun dessert (am I alone in this?!). 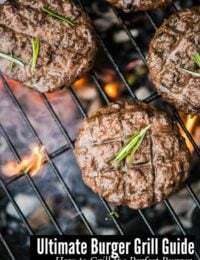 Personally, I am the same but find it’s the salads that make an outdoor grilling party or picnic the most memorable (partially because they can be so boring). There are three things I think make a perfect summer salad: 1) lots of color, 2) crunchy texture, and 3) great flavors. The abundance of fresh ingredients in summertime make the choices almost limitless. 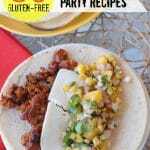 These gluten-free summer salads fulfill my three criteria and would be welcome at any cookout, picnic or grilling potluck. You might wonder why a traditional tossed green salad isn’t on the list. 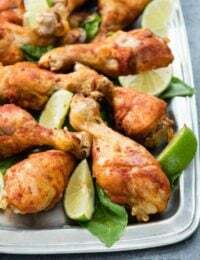 I have plenty of recipes for those in my Salad recipe section however they simply don’t stand up to summer heat when on an outdoor buffet or at a picnic. 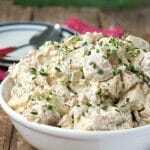 The salads listed here are robust and will stand the heat, are portable and easy to serve. One caveat for that of course are any salads with mayonnaise in the dressing. 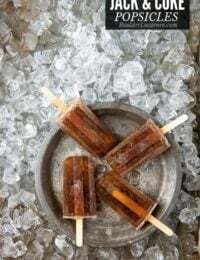 Those need to be kept cool either in a cooler of place them on a bed of ice in a disposable metal pan from the grocery store. 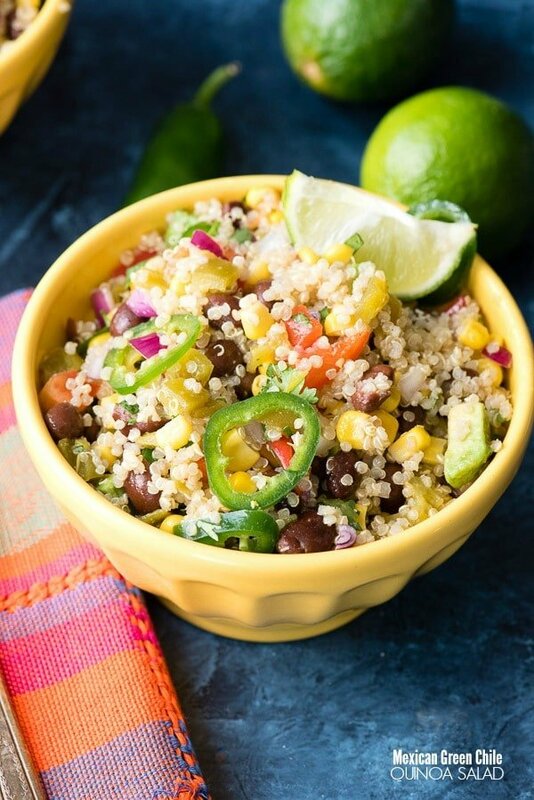 Mexican Green Chile Quinoa Salad ticks all the perfect salad boxes (and even adds some spicy heat) as well as is full of healthy vegetable protein. 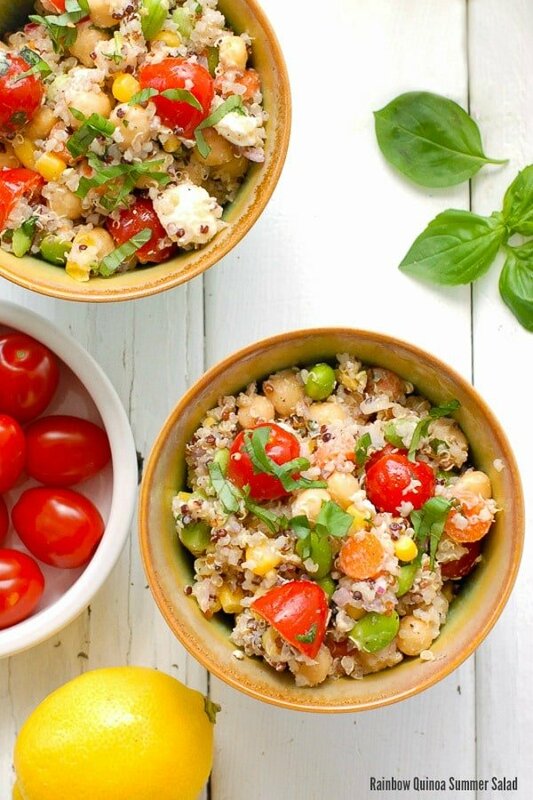 Quinoa salads are a wonderful substitute for gluten salads with couscous too. Quinoa is very similar in size and texture but is gluten-free. 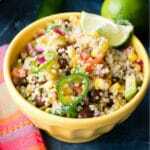 Rainbow Quinoa Summer Salad is another mix of colorful summer vegetables in a tasty dressing. 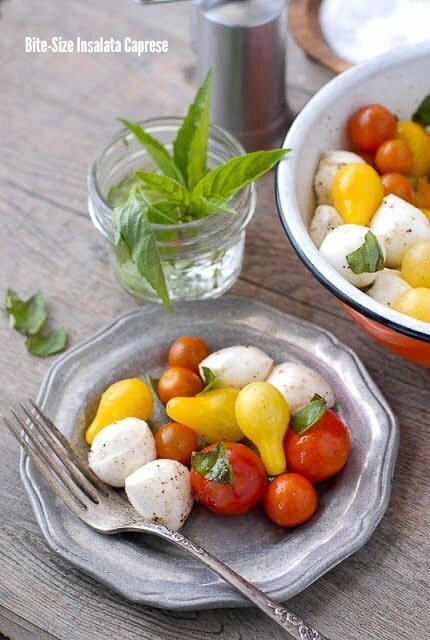 Cherry tomatoes, corn, fresh basil, carrots, mini mozzarella cheese and more create a mixed salad bursting with the flavors of summer. 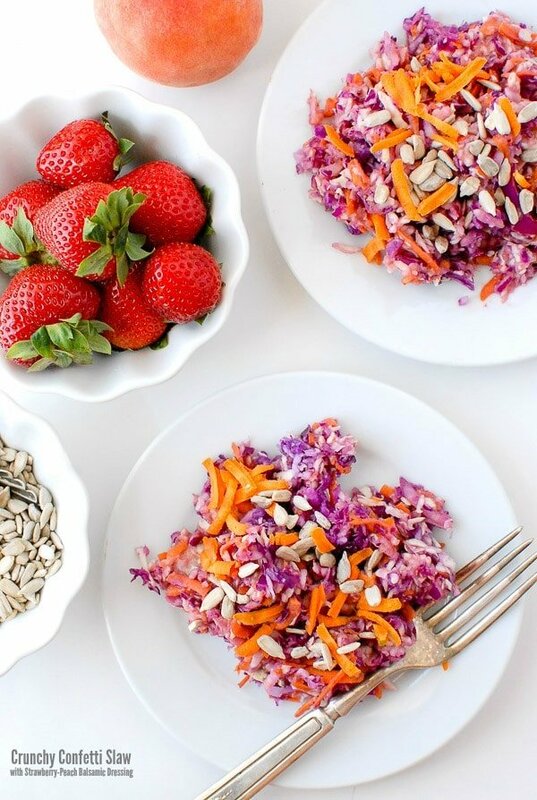 For lovers of summer fruits this Crunchy Confetti Slaw with Strawberry-Peach Balsamic Dressing is a colorful combination of slaw ingredients with a fresh fruity dressing. Fresh strawberries and juicy, ripe peaches are used to whirl up into the dressing. If making out of season frozen, thawed fruit may be used as well. 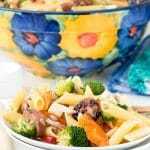 Broccoli Sausage Pasta Salad is always a favorite with my crew. 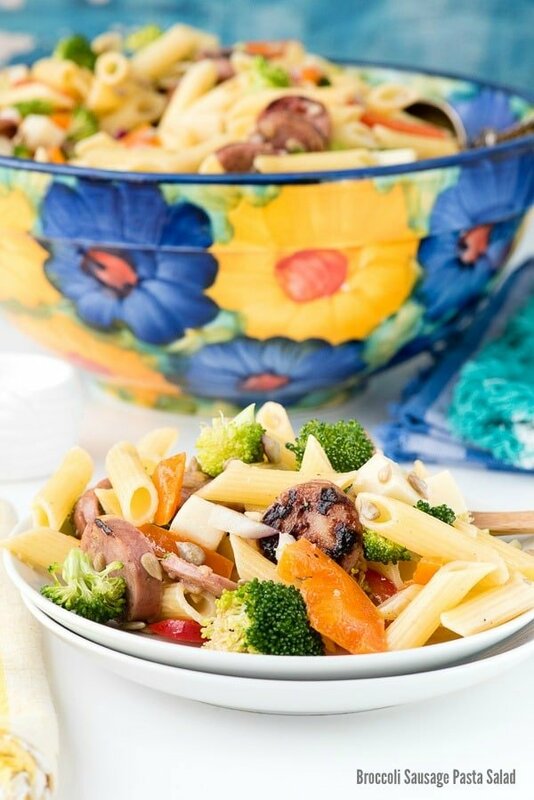 Chicken apple sausage slices, broccoli, penne pasta, onions in a tasty sauce make for a filling salad with great crunch. Gluten or gluten-free pasta may be used. Insalata Caprese is my all-time favorite salad when dining at an Italian restaurant. The simple combination of fresh, ripe tomatoes, buffalo mozzarella, fresh basil with a drizzle of olive oil truly is mouthwatering. This Bite-Size Insalata Caprese is perfect for summer dining as it doesn’t require cutting of the tomatoes when eating. The small size of the tomatoes and mozzarella balls provide ‘making’ the salad will take about 30 seconds. It’s really rinsing, tossing and serving. 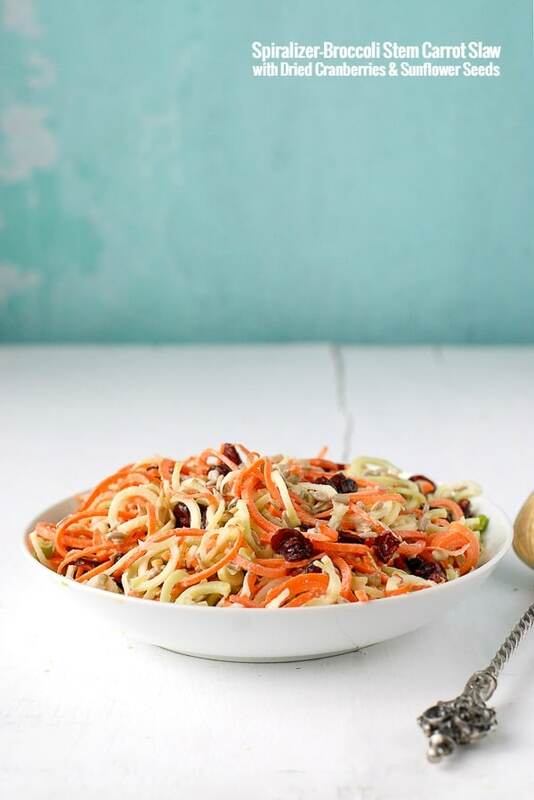 If you like using a Sprializer, you’ll love this Spiralized Broccoli-Stem Carrot Slaw with Dried Cranberries. Spiralized carrots, broccoli stems and tart dried cranberries make for a fabulous flavor and texture combination. Broccoli stems are often discarded after the beloved florets are chopped off. Once the thick outer skin is removed the tender, sweet interior is truly a treat. Zucchini is the epitome of summer vegetables and often goes rogue when left unattended in the home garden. 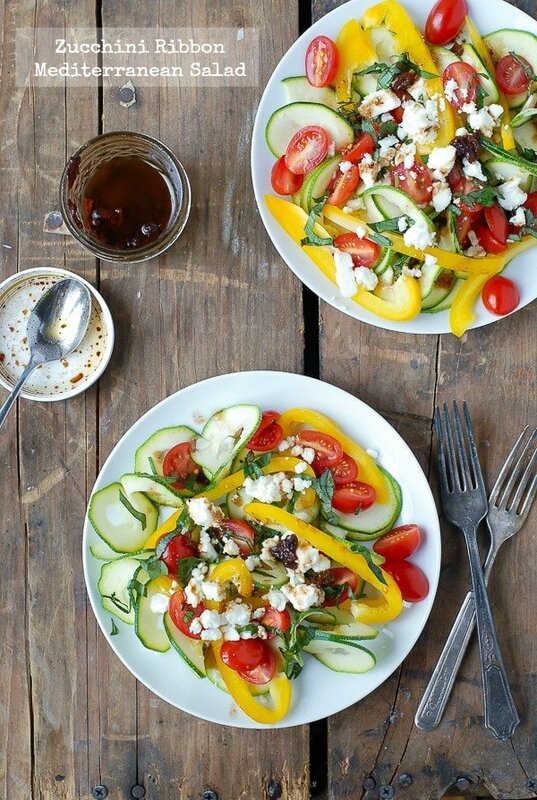 Zucchini Ribbon Mediterranean Salad has ribbon zucchini (again made with a Spiralizer), sun dried tomatoes, feta cheese and more. It tastes like a sunny Italian vacation to me. No outing is complete without macaroni salad, right? 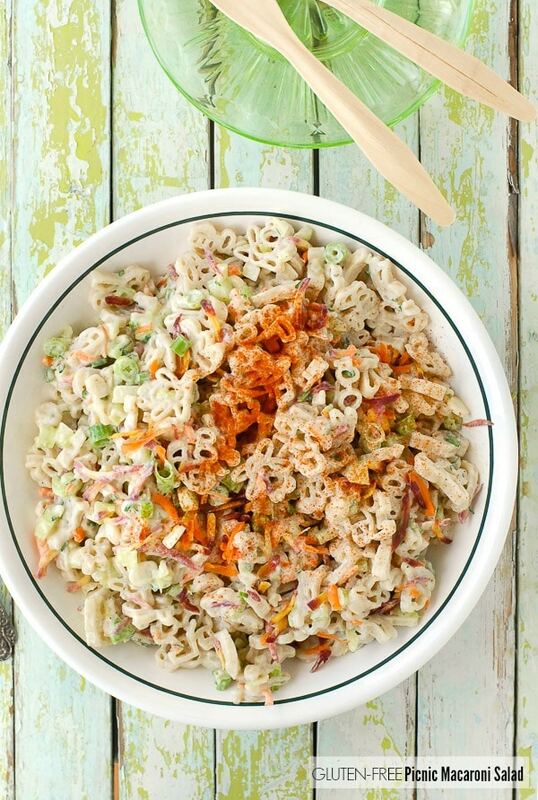 Picnic Macaroni Salad is the perfect choice for a summer outing. Carrots, celery, scallions and herbs combine with cooked elbow pasta and a tangy sauce. I used some whimsical shaped gluten-free pasta too! As with any salads with mayonnaise in the dressing, be sure to keep the salad chilled in the hot sun. Chicken Salad with Cranberries, Slivered Almonds and Green Apple is great as a side salad or as a filling for sandwiches. Though it’s not bursting with color, the sweet and salty flavor combination makes up for that. The crunch from the green apple is also fantastic. 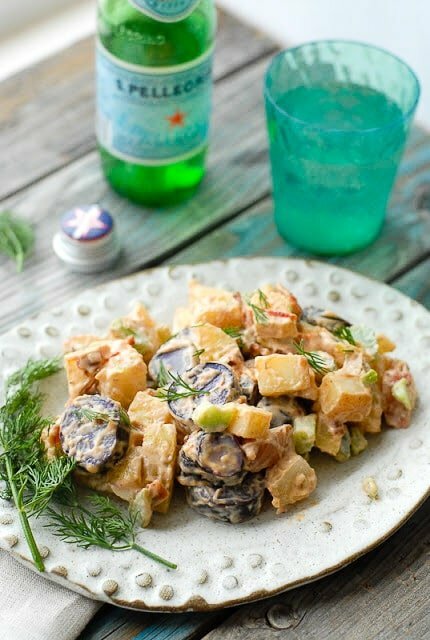 Tri-Color Chipotle Bacon Potato Salad is a riff on the classic potato salad. These days potatoes come in many colors and combining them makes for a dynamic in visually exciting dish. Adding some bacon and some smoky chipotle to the already beloved comfort food salad knocks it out of the park. Gluten-free summer salads are portable and quick to prepare in most cases. Keep them on hand in the fridge for the dog days when cooking isn’t in the cards. What a collection of delicious salads! 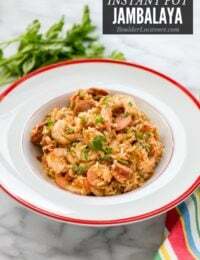 I would love to make the macaroni salad and Tri Color Chipotle Bacon Potato Salad. Just looking at the pictures and learning about the ingredients made my tummy grumble. That rainbow salad is such a good idea. 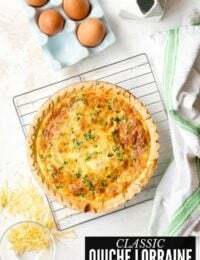 I’d love to make that for Memorial Day weekend! 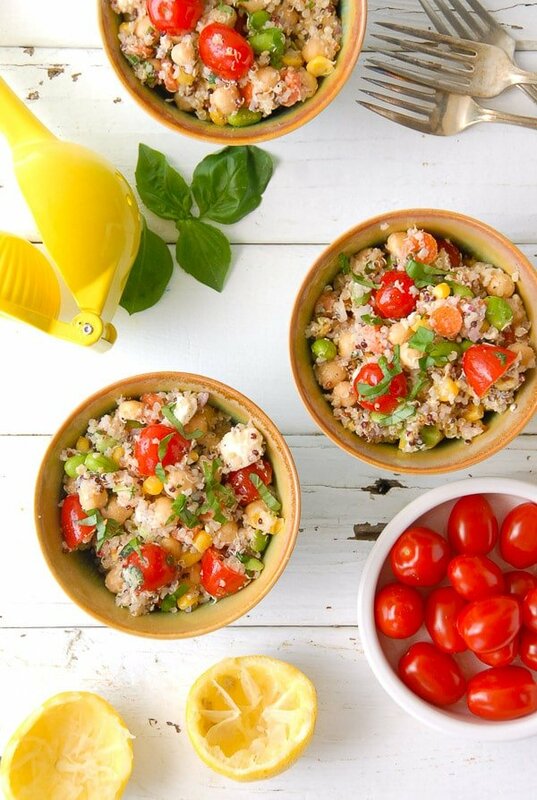 I love these summer salads, especially the one with the rainbow quinoa. I am definitely bookmarking this. We have an upcoming family get together dinner and this is perfect! The salads you have using quinoa are my favorite. I eat everything with quinoa! I love summer salads and would love to try the confetti slaw. I usually make a pasta salad and a caprese.